Nabors is your Top Rated Local® Garage Door Service & Repair company in Bartow County. Owned and operated by Ronnie and Serena Meador, Nabors strives to better our community by providing our customers with simple and reliable garage door services. Our number-one goal is your trust and satisfaction; that’s why we’re committed to cost transparency and the best customer service in the industry. We understand that garage repair situations can arise at any moment, and often times, people don’t have time to fuss with a large franchise that can be unreliable and isn’t focused on your satisfaction. As a local, family-owned company, we have a desire to serve our community and create a trustworthy relationship between customers and our small business. This way, you’ll get the services you need without ever having to worry about the job getting done correctly the first time! Are you ready for a new garage door in Bartow County? Nabors Garage Doors is your trusted source for garage door installation. And if you need help with installing garage door springs and garage door openers, we can help with that too! Our traditional-style Amarr steel doors are great for a clean and classic look. You’ll have the option to choose from four different designs of panel, six different base colors, and a countless selection of windows. Nabors has a selection of Carriage House Style doors in both wood and steel. These types of doors are great for giving your home a more classy, country-style look. Although from a distance, they appear to operate differently than traditional doors, you’ll get the same functionality as any standard garage door. If you’re looking for even more options, our specialty doors are for you. These doors are made of aluminum and iron with unique openings. If you want something a little more modern, these are a great option. If you’re getting a new garage door installed, we won’t stop there, we’ll make sure your garage door is fully set up and ready to go with a programmable garage door opener or overhead garage door opener of your choosing. Nabors is an official Liftmaster dealer and always have the Elite Series 8550 Liftmaster and Premium Series 8355 Liftmaster in stock. Contact us today to learn more about our remote control garage door openers. If your garage door becomes damaged, worn, or faulty in any way, you may not be ready to commit to buying a whole new garage door. That’s why Nabors will provide you with a full-service garage door repair by conducting a 25-point inspection that will get to the root of the issue and allow us to get your garage door back to working condition. If you find yourself in need of garage door replacement panels, garage door cable replacement, garage door roller replacement, or any other replacement parts, we’ve got you covered! We aim to fix an issue immediately after diagnosing it, however, in certain situations, we may need to order parts that are required to get your garage door back to normal operating condition. If you would like a garage repair quote, please contact us. 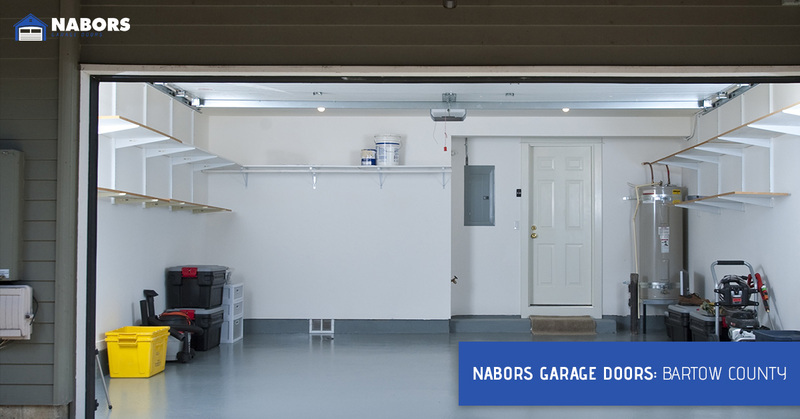 In order to prove to you our unyielding commitment to your satisfaction, Nabors has 24/7 garage repair services so you can sleep easy knowing that we’re here to help! If you’re ready to get started, contact Nabors Garage Doors today, or visit our Special Offers page to see what deals we have going for garage door tune-ups, repairs, garage door opener installation, and garage door installation. We serve all areas in Bartow County such as Cartersville, Adairsville, Emerson, Kingston, Euharlee, and Rydal, so don’t hesitate to contact Nabors next time you need us!